"Hey man, for twenty bucks I'd take you to a Ku Klux Klan cookout!" A simple case where form doesn't follow function. Roger Moore is (in)famous for bringing out all the campiest aspects of Bond. He cares more about bedding attractive women (always significantly younger than himself) than about finding the bad guys or saving the day, and when he does have to do some killing it's always with a snarky one-liner. This form of Bond is fine on its own (admittedly it can be more fun than some of the more serious installments), but it doesn't work here, where the function of the narrative attempts to comment on racial tensions. Silly Bond doesn't mix well with blaxploitation. 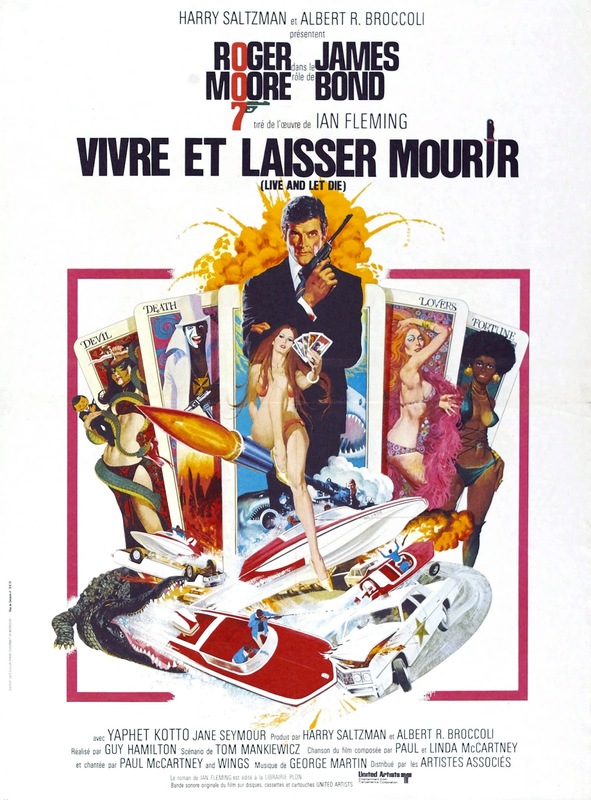 Live and Let Die could have been one of the most interesting Bonds to date for the way it tackles the issue of race. Bond has always been a character defined by his nationality, not only because he's working for a government agency (making him an embodiment of the country's ideological national politics), but also because he would do things like walk around in a kilt (a loaded signifier of national heritage), and make remarks about acting "for Queen and country." Here he's thrown into situations where he's the racial outsider ("Can't miss him. It's like following a cue ball.") or where he's being pursued by a racially charged antagonist ("Uptown? You headed into Harlem, man!"). This is somewhat familiar territory for 007: even beginning with Dr. No, the Bond films have had a preoccupation with placing the secret agent in exotic locations where he's simultaneously out of his element (being threatened by an unknowable enemy) and enjoying the scenery (both landscapes and females). But Live and Let Die takes these themes and transposes them onto the blaxploitation genre. This exotic, alien Other is embodied in the figure of the African, both in his urban (American) and native (African) context. Kananga represents the black man in the socialized environment of the city (running drugs) whereas Baron Samedi evokes his exotic, chaotic, aboriginal underside (voodoo mysticism). Except, instead of commenting on this juxtaposition of the white Bond and his black aggressors, the film simply uses the context as a framework for inducing a racially charged paranoia. The film cuts to shots of black men we haven't been introduced to in order to build tension, as if to say all the black men in the world are after 007 (even Rosie, the only potentially positive black character, is revealed to be a double agent). We are meant to fear the dark-skinned characters so much that simply seeing them should cause us distress. Honestly, though, I would rather have a film with these problematic racial politics than one which is simply boring (it at least gives me something interesting to think about), so if the rest of the film had been at least enjoyable I might have ended up liking this one just for the fascinating new world it places our hero in. So maybe the biggest problem with Live and Let Die isn't that it's potentially racist, but that outside of this conflicted tension there's nothing else going on. It could have been a fascinating blunder, but instead it's more of a dull blunder. The reason I found this such a boring affair is rooted in the way it sets up the plot. In the opening scenes of the film, several unnamed MI6 agents are shown being killed, and Bond is sent to investigate their deaths. It's interesting to look at these death scenes as a series of fake-outs for who the new Bond would be after Connery left, but narratively this is one of the least compelling ways to structure the film. Bond is sent in with the vaguest of missions, and then the plot progresses by putting him in situations where he's out of his element. Each new development plays out as though he's being pushed forward by forces beyond his control, removing his agency and making him less of a super spy and more of a fool (a tendency which would come to characterize the Moore Bonds). Even when Bond's responsible for escaping the dangerous situations he's placed in, these scenes lack tension because he's not in control of his fate, and they lack excitement because he escapes them by running away (jumping across the crocodiles' backs, speeding away in a boat, etc.) rather than conquering the obstacle. Previous films placed Bond in a situation where he's out of his element, but then showed how great a spy he is in the creative ways he would solve his dilemmas. Here he's just lucky or unlucky. The exception to this pattern comes in the scenes where 007 is taking a bath in his hut and a snake sneaks into room and starts slithering toward him. He doesn't notice the danger which is being shown to the audience (classical Hitchcockian tension), and he resolves the situation by being a badass and turning his aftershave into a flamethrower. The problem with this scene is not only that it's the exception that proves the rule, but also that it's ruined by having its payoff be the shrill shrieking of Rosie, possibly the least empowered Bond Girl to date. Although this admittedly excessive critique of the film may make it sound like I hated Live and Let Die, that's not quite the case. There are a couple of laughs ("He always did have an inflated opinion of himself"), a couple of memorable elements (the scene with the snake and Baron Samedi's creepy laugh), and enough racial commentary for me to chew on after the movie was over. But mixing silly Bond with serious racial politics didn't work here, and the addition of set pieces that were ultimately quite dull affairs didn't help matters. I'm probably being harsher on the film than it deserves, but this is the first in my series of Bond rewatches that almost put me to sleep, and such a waste of potentially interesting material left me disappointed, frustrated, and slightly annoyed.